It’s the kind of heist Karyn Ames has dreamed of—enough to set her crew up pretty well and enough to keep her safely stocked on a very rare, very expensive black market drug. Without it, Karyn hallucinates slices of the future overlapped with her present until she’s incapacitated and completely overwhelmed. But there’s a hitch. The client behind the heist is Enoch Sobell, a notorious crime lord with a reputation. Once you’re in business with him, there’s no backing out. Karyn and her associates are used to the supernatural, but their target is more than just the usual family heirloom or cursed necklace. This time, Karyn and her crew are about to get themselves wrapped up in something awfully dangerous and a whole lot bigger. I don’t usually enjoy heist or crime novels, but Premonitions drew me in from the first page. The novel combined great elements of urban fantasy, mystery-noir, and some serious psychological horror. It was darker and bloodier than I expected, and it delivered in every way. Fantastic, twisting and turning plot: check. Wide range of real and interesting characters: check. An intriguing world I want to know more about: check. Grisly, wince-worthy description: check. Jamie Schultz hit the nail on the head portraying Karyn’s struggle with her visions. The description of a missing eye and blood spurting from a forehead bullethole made me squirm a little—but it wasn’t real, because Karyn was just seeing a possible future. The way that Schultz tackled her predicament was admirable and one of the best aspects of the book—shocking, gruesome, and truly psychologically terrifying. Karyn’s visions and condition make her a very interesting character, and I felt like we got the most development from her. Anna, Karyn’s best friend and second-in-command, was a fascinating character but not developed enough. I didn’t fall for her like I fell for Karyn—the same with the others in the crew (Nail, Tommy, and Sobell’s contractor Genevieve). Speaking of Sobell, the surprises that come along with him make for a fantastic ride. You never know what what his next move is, which make him a fantastic villain (if you can call him a villain). Premonitions is a plot-driven novel, and while that isn’t entirely to the books detriment, it was missing some deeper character development. Readers get multiple POVs, and I wanted to know a lot more about the characters’ backgrounds and who they are now. The book was very focused on the plot and the action, which was incredibly well-done. Hopefully, in future books, we see more of the characters, because they’re the real heart of the story. 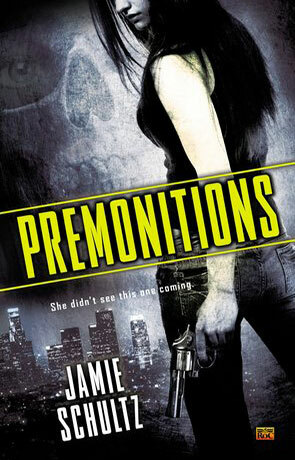 A fantastic story about a heist, the occult, black magic and the very hard choices that need to be made, I would recommend Premonitions anyone who enjoys a good dark, grisly, action-packed story. Written on 20th November 2014 by Vanessa.